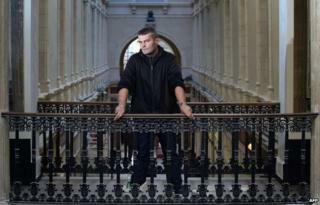 A French appeal court has refused to allow a father to take custody of his biological son, who was given up for adoption by his mother. Yoan Delorme, 29, was in jail when his son was born and the baby's mother did not write either parent's names on the birth certificate. His case was backed by a court in Nantes earlier this year, but the local council appealed as the boy was already settled with his new family. Mr Delorme aims to fight the ruling. The latest court ruling also said he had no right to visit his son. "It's the theft of a child by the general council," Mr Delorme told reporters. Mr Delorme had no contact with the child's mother after her first three months of pregnancy. After she gave birth in April 2013, he was unaware the baby had been registered without his name and his lawyer tried in vain to locate the boy. When the boy was two months old, the general council in the western area of Loire-Atlantique placed him with a family for adoption. Hours later, on the same day in July 2013, his father applied for the child not to be adopted and said the child was his. The local authority said, however, that he had not said what his plans were for the boy and whether he planned to take care of him. After a court in Nantes ruled in the father's favour in April, the decision was backed last month by the Advocate General, but Loire-Atlantique general council and the public prosecutor then took the case to the appeal court in Rennes, which has now overturned the ruling. The baby's adoptive parents, both in their 40s, have themselves spoken of living through "hell". "It's the culmination of little things that have led to a catastrophe," said their lawyer, Guillaume Le Maignan. Cutting the child off from the couple would have been enormously traumatic for the boy, he added. Mr Delorme told reporters he would take the case to France's top court, the Court of Cassation, and to the European Court of Human Rights if necessary.